Q: With most modernisation programmes facing the problem of units being in different geographical terrains, how are BCB, with their 50 years of experience, helping to supply correct equipment for each theatre with the ability of having experienced staff? Q: One of the main problem areas is correct hydration for deployed troops, to prevent heat stress injuries, how can BCB help with this? A: Troops serving in Afghanistan are being weighed down by the sheer load of essential kit they are required to carry. From medical and radio equipment to body armour, ammunition and water supplies, soldiers on deployment in Afghanistan are on average saddled with up to 120 pounds of kit they have to lumber around while out on patrols in the field. This has consequences for their operational performance as well as their health and wellbeing. Regular water intake is essential to maintain the core body temperature. However, all too often the typical hydration systems (portable water reservoirs) used by soldiers in Afghanistan lets them down because the water inside them becomes warm and unpleasant which discourages drinking. BCB’s unpowered ‘Chilly Water Cooler’ reduces the temperature of a soldier’s drinking water by up to 25 degrees Celsius through the power of evaporation. With the Chilly, water passes through a series of cooling fins which allow a small percentage of water to seep onto a wicking cloth. In recent US Army commissioned desert trials, the Chilly came out on top with more marines saying they preferred it to stay hydrated than alternative devices. The ‘Wall Breaker’ in action. © BCB. Q: If we talk about personal protection, the main areas being looked are weight reduction and increased protection, how is this effecting purchases and what can you do in this? A: Reducing the soldier’s burden is what we are about. We have made advances in the field of load carriage to improve the mobility of the combat soldier. IEDs are the single biggest cause of deaths and injuries to troops in Afghanistan, so anything that helps dismounted soldiers deal with these threats safely without adding too much to their burden is very much welcome. Weighing in at just 420 grams, BCB International Ltd’s Personal (IED and) Mine Extraction Kit (PMEK) is a compact lightweight kit which fits neatly in a MOLLE (Modular Lightweight Load Carrying Equipment) belt pouch. It is designed for dismounted soldiers as well as vehicles to carry at all times when patrolling in an area of country where mines or IEDs could be lurking. It can be assembled in seconds and contains all the components troops need to extract themselves out of a minefield confidently and safely. Our heat-defying ‘Mistral’ Cooling System represents a major leap forward in under armour body cooling. 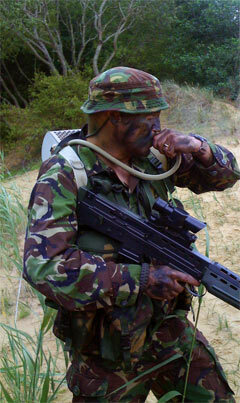 It can be integrated into all types of body armour including Osprey, Kestrel and Interceptor. Using three cooling circuits which sequentially blow air to different zones under the body armour for up to 10 hours, the Mistral helps troops feel cool which improves their combat performance and concentration. The plug-in fan unit is easy to connect for replacement or to connect to combat vehicles’ air conditioning systems; making the Mistral system ideal for troops serving in hot climates. The lightweight SQ-4 NUAS. © BCB. Q: With the increasing policing role of both marine and infantry forces, there is a need for non-lethal solutions to any threatening situation both on land and sea, is this an area that the company has been looking at? A: BCB International Ltd are at the forefront of non-lethal solutions. We have developed a suite of pressurised air launchers which fire a variety of projectiles with enormous power, without explosives and with variable force. 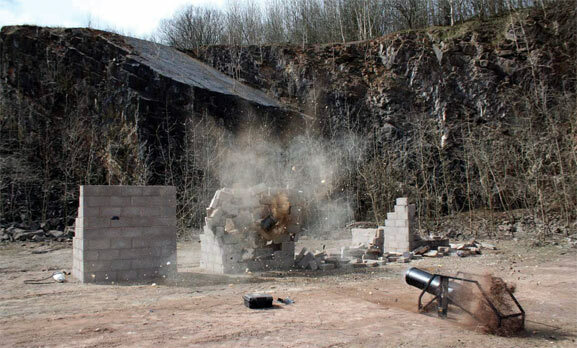 For security teams and counter-terrorism officers, the use of explosives in hostage rescue operations is a high risk strategy because the explosion and the debris can injure or kill the very people you are trying to rescue. Our ‘Wall Breaker’ is an ideal alternative because it uses compressed air to fire a big barrel of water which can smash through a double layer breeze-block wall. What’s great about using water is that the casing shatters and it just sprays out water. This means that security teams are much closer to the point of entry, giving them vital seconds and more importantly, it reduces the harm caused to hostages inside a building. The anti-piracy Buccaneer. © BCB. Piracy at sea has long gripped the imagination with its romanticised image of swashbuckling heroes, buried treasures and tales of high adventure. The reality in the modern age however is a rather different story, with acts of piracy costing world trade an estimated 7 to 10 billion US dollars annually. It is almost impossible to calculate the human cost of those held for ransom against their will for extended periods of time. Ultimately the use of lethal force should be selected as a ‘last resort’, whereas non-lethal protective measures can help to create a ‘layered’ and proportional defence around a vulnerable vessel or offshore platform. 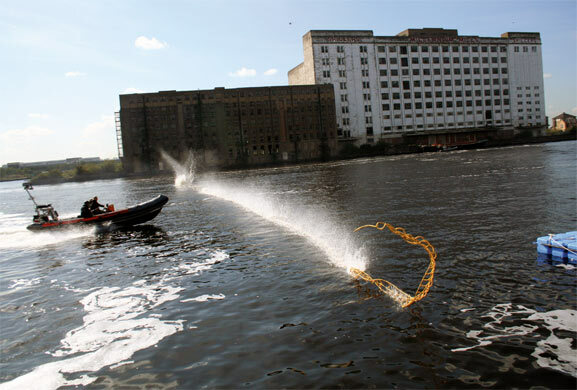 BCB International’s ‘Buccaneer’ launchers utilise compressed air to launch 60 metre entanglement nets designed to foul on-coming skiffs’ props and therefore disable the attacker before they have a chance to attempt a boarding. Usefully the Buccaneer can also deploy pay loads such as smoke cartridges out to 700 metres which means that, like the LRAD system, it can create an effect on a target well before it comes into close proximity with the vessel. Q: This also raises the question of security, target acquisition and intelligence gathering allowing ground troops to make correct decisions on engagement and protection, could you discuss your UAV and NUAV products and their benefits? A: For troops on the ground, as well as law enforcement agencies, having quick access to Intelligence, Surveillance and Reconnaissance (ISR) footage of their immediate area is vital. 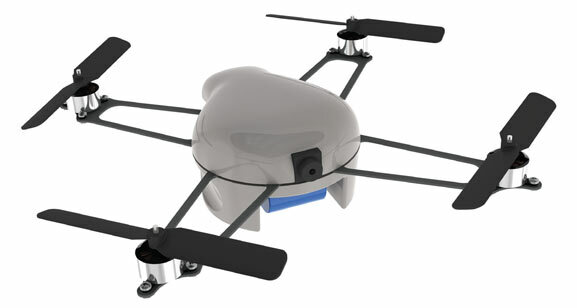 BCB have designed what are believed to be the UK’s first lightweight and cost effective Nano Unmanned Aerial Systems (NUAS), the SQ-4s, which can be out of a soldier’s rucksack and in the air within seconds. They are absolutely ideal for spotting potential dangers lurking over a hill, in a building or in a crowd control situation. Using First Person View (FPV) and weighing 2 oz, two units fit snugly into a soldier’s daypack from which it can be in the air in less than 25 seconds. It also does away with complicated laptops, allowing rapid deployment. Flying silently, it can hover discreetly over a targeted area or ‘perch and stare’ using day or night vision. Unlike your wayward boomerang, the SQ-4 knows its way home. If the operator starts losing control or when the battery reaches 30%, the SQ-4 will automatically return to the launch point. 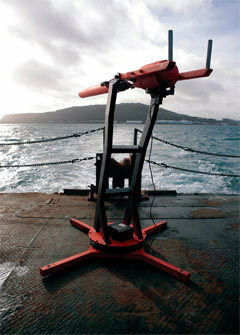 A 60 metres floating vessel entanglement line is deployed by a “Buccaneer” launcher. © BCB.